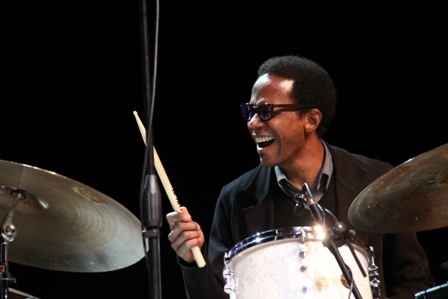 Acclaimed jazz percussionist and former Loyola student Brian Blade will perform in two concerts Saturday, March 9 as part of the 44th Annual Jazz Festival at Loyola University New Orleans. Held in the Louis J. Roussel Performance Hall located in the Communications/Music Complex, the two-day festival is presented by Loyola’s Jazz Studies Program. In addition to Saturday’s concerts, the festival also includes a free performance by the Loyola Faculty Jazz Septet Friday, March 8 at 4:30 p.m. in Roussel Hall. Free masterclasses will also be held on Friday, March 8 and Saturday, March 9 at 12:30 p.m. in the Communications/Music Complex. The concert and masterclasses are open to the public and are made possible through support from the Louis Armstrong Educational Foundation and the Thelonious Monk Institute of Jazz. The Loyola Jazz Festival is open to large or small instrumental jazz groups from the elementary through junior college level. More information is available online, and the deadline to apply is Feb. 22.